Exciting news! 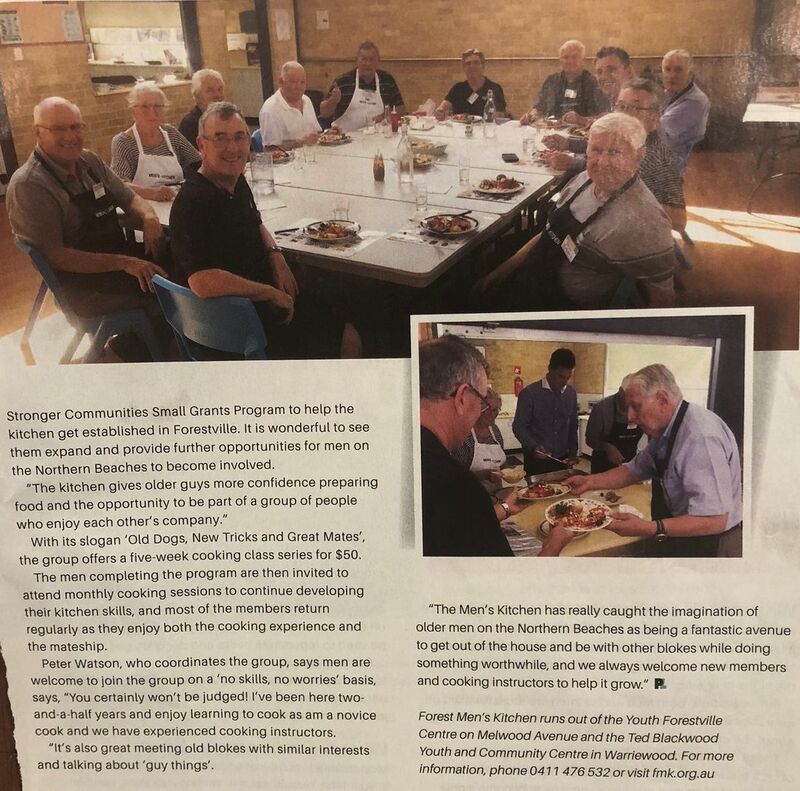 Due to the increased interest in the Men's Kitchen and quite a few new members, all resulting from a recent Peninsula Living magazine article, from November 2018 we will be operating a second Cooking Session per month in our Warriewood Kitchen. 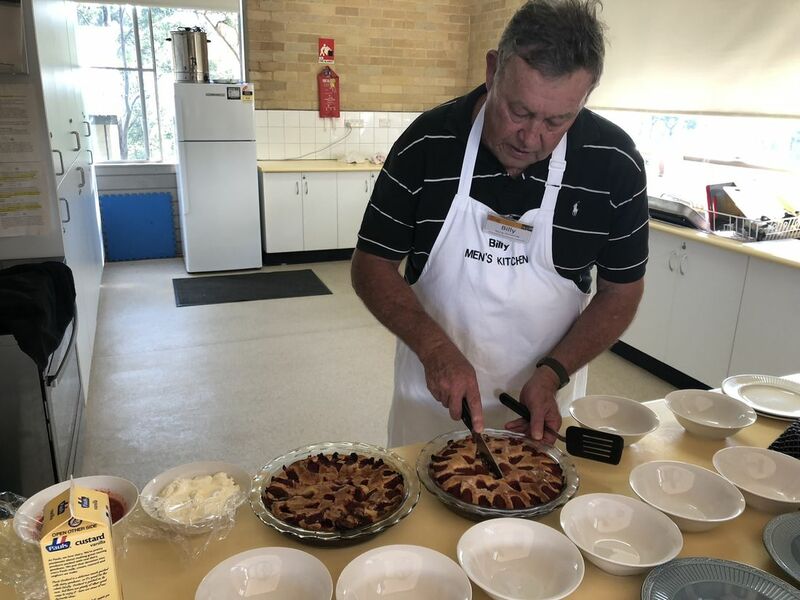 This will now provide men on the peninsula with two venues and five different Cooking Session dates each month on which to learn new cooking Skills. 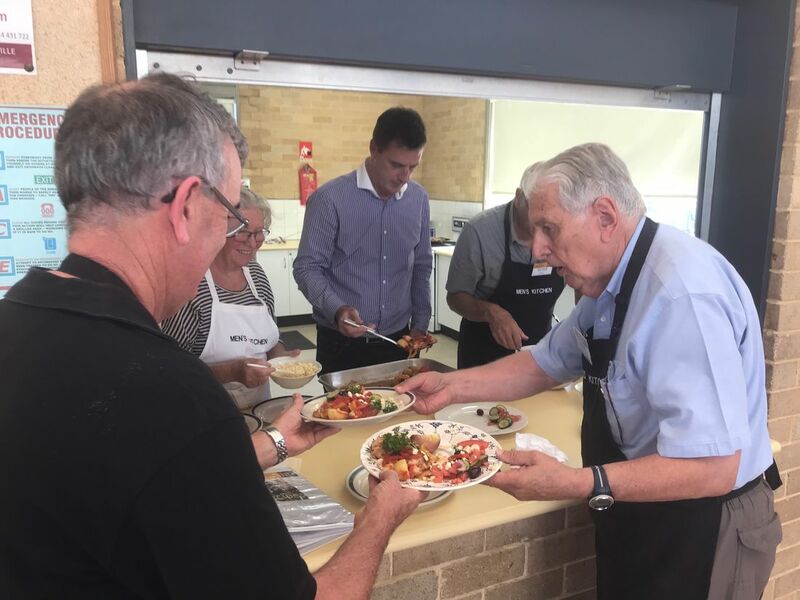 From November, we will be cooking on two Wednesdays each month at the Ted Blackwood Centre in Warriewood; on the 1st Wednesday and on the 3rd Wednesday of the month. Please refer to our Calendar for the dates. 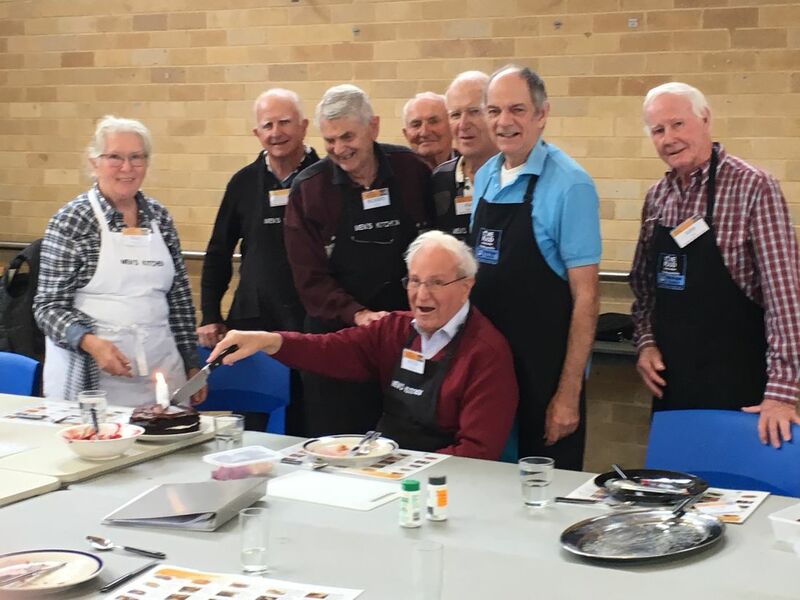 On Saturday 6th October we ran a BBQ at Bunnings Belrose to further promote ourselves to older blokes and to raise a few dollars to make our budget for 2018-19. We had a cracker of a day! Twenty members attended to run the BBQ and we needed every one of them; it was that busy despite being a bit wet in the morning. We sold nearly 800 sausage sandwiches and that put our processes to the test. I'm sure all attending had fun but had sore feet the next day. We also ran a raffle; here are the results. 1st prize a $100 Bunnings voucher: William Dunn from Mona Vale. Congratulations to each of you and thank you for supporting the Men's Kitchen. 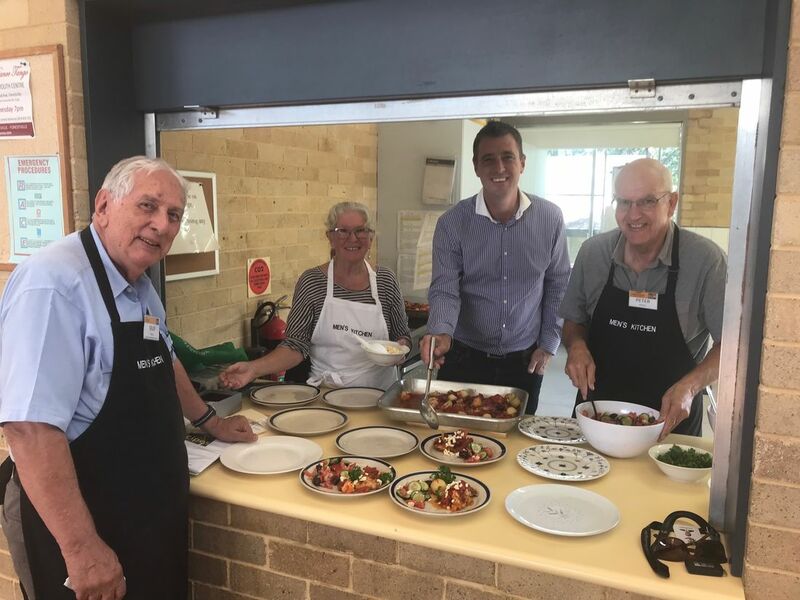 In September 2018 the Peninsula Living magazine published an excellent article about our visit from the Northern Beaches Council Mayor. This article has attracted a lot of interest from older men and even from a few family members of older men. We welcome new men to join us and look forward to seeing each of you at a Cooking Session very soon. May 25th Peter turns the big nine - zero! On May 25th Peter joined our very select group of nonagenarians. We have three in our membership now and all three are very active and love their cooking. Happy Birthday Pete! 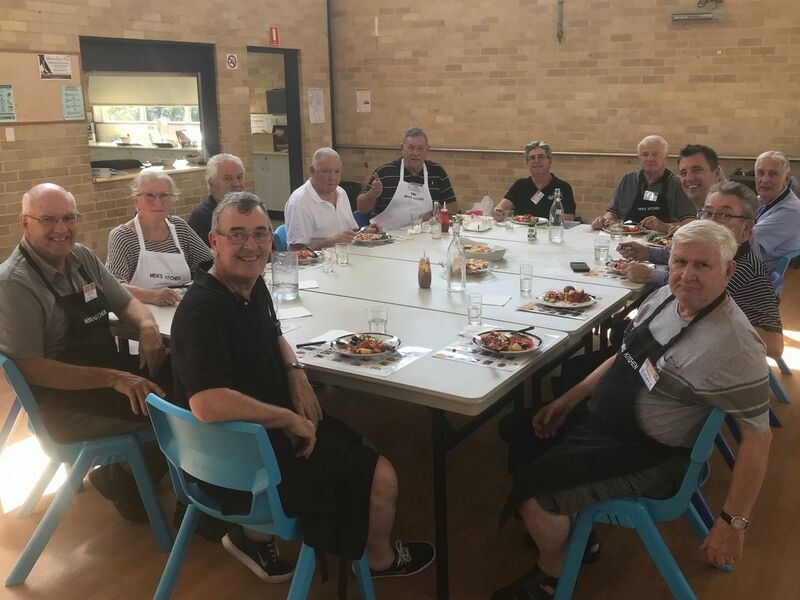 The Northern Beaches Council has been very supportive of the Men's Kitchen organisation right from the beginning, and when we opened our new venue in the Ted Blackwood centre in Warriewood Cr. Regan provided sufficient funds to effectively cover the rental of the centre for the remainder of this calendar year plus a little extra to help set up our initial pantry in that Kitchen. On Thursday April 12th, Cr. Regan joined us for lunch so he could see first hand what we do and enjoy a meal that the men prepared. 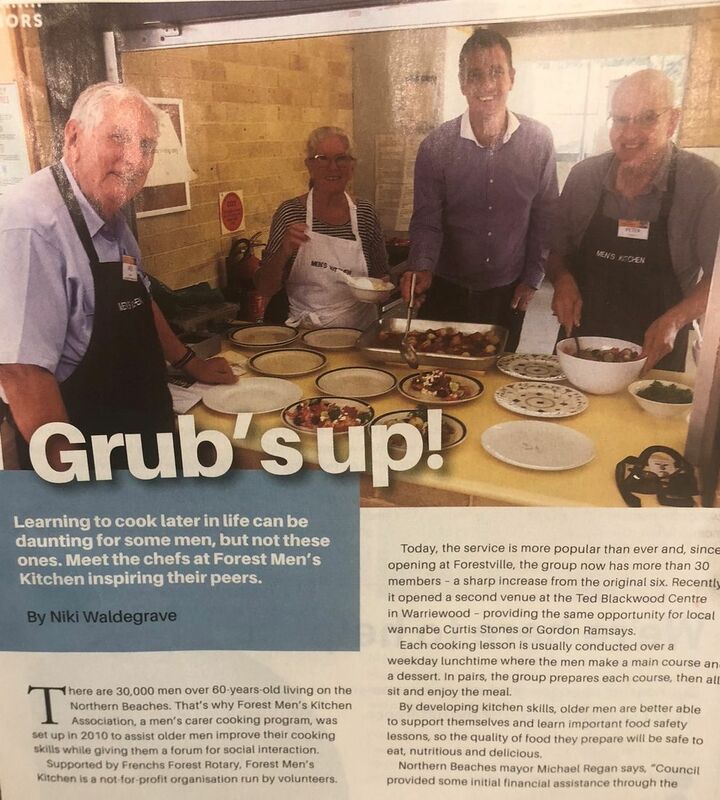 On Friday April 6th 2018, Northern Beaches Council conducted a Wellness Expo in support of the Northern Beaches Seniors' Festival and Forest Men's Kitchen was invited to run an information booth there. 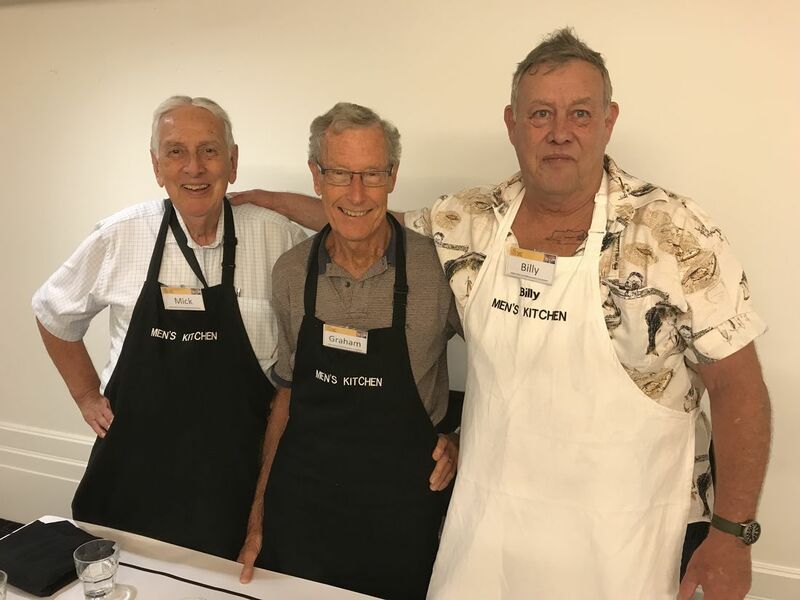 Billy, Mick, Graham, Austin, Peter R and Peter W manned two, two hour shifts to promote the Men’s Kitchen and to see if we could get some men interested enough to attend our Open Days next week. We spoke to many people and received interest from quite a few potential new members. Mick, Graham and Billy were snapped by one of our visitors while they were doing a great job. On Thursday March 1st we had a chat with shoppers at Warriewood Square and gave out a few fliers, well about 50 actually. Thanks to Billy, Mick, Peter R., Graham and Peter W. we enjoyed the opportunity to talk to local men about our new operation in the Ted Blackwood centre, which was literally next door to the shopping centre. We noted the contact details of interested men and will be in touch in the next day or so. We're looking forward to having Stuart, Alan, Ron, Eddie, Ross, Norm, Geoff, Peter, Anthony and Darrell join the Forest Men's Kitchen team. After several months of planning, we have now openned a second venue in the Ted Blackwood Centre in Warriewood. 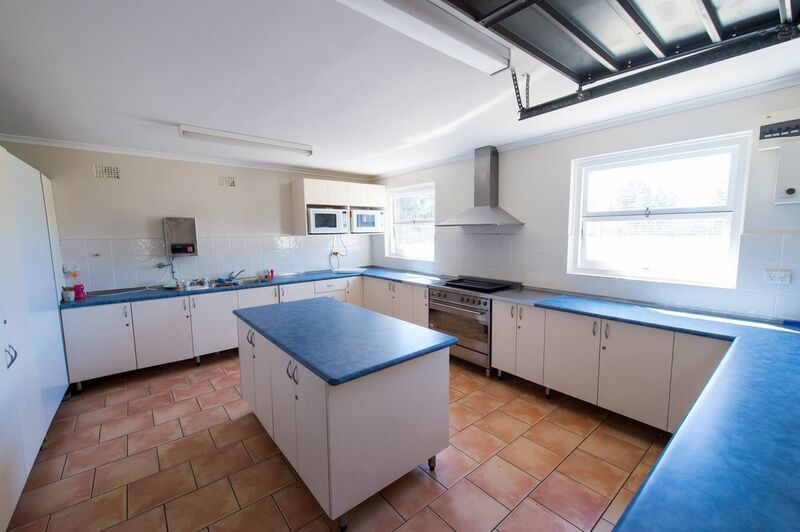 The kitchen there is fantastic, with loads of benchspace and the centre owner, the Northern Beaches Council, is keen to help us get established, firstly by making a few minor changes to the kitchen to suit our needs, and also by providing us with a huge cupboard for our pantry and an underbench cupboard for some of our utensils. If you are interested in coming to our Cooking Sessions at this new centre, please contact us to book in.